Printer: J. Munns & Co. 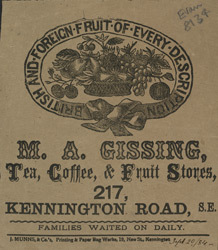 This is an advertisement for M. A. Gissing's grocery store. Grocer’s stores were usually small and independent shops, run by one master who would also have owned the store. He would have ordered the produce, hired and fired employees, ensured that the books were kept up to date and would have also served the customers in the store. He would have known every customer by name and would have an idea about their likes and needs for the coming week. A grocer would usually have 1 or 2 apprentices who would have taken care of deliveries and worked in the store stacking the produce on the shelves.